We have been enjoying the energy of all of the vendors & community members alike. Even with the rainy Tuesdays we have had, and more importantly the rainy days the farmers have been having, there has been a lot of laughter & camaraderie amongst all market friends. The variety at the market is growing weekly & the number of vendors is happily expanding! It’s great to have Molly B’s Gluten Free Kitchen and The Remarkable Bean part of the ranks. This week FloraLora Flowers will start selling sustainably grown flowers from their farm in Prince Edward County. It will be attempt #3 (weather pending) for Corina Tudor to take you through some warrior & tree poses with yoga in the park, starting at 4PM (bring a mat if possible). And our weekly musical entertainment will be provided by Bradley James McGoey (our personal favourite is his Paul Simon cover- Diamonds on the Soul of her Shoes). Let’s all hope for the sun to shine so you can enjoy a dry stroll in the park & chat with the folks selling you these local goodies! Freshly picked yellow & green beans, zucchini and sweet red beets will be coming with Jim Hayward of Haystrom Farms. Trillium Organics Farm will be back with cauliflower, broccoli, colourful swiss chard & pickling cucumbers. P & H Farms will have a table of lettuce greens, kale, carrots, sorrel & ever-spicy radishes. Expect to see a continuing array of garlic scapes, garlic flowers, onions & so much more among the other wonderful vendors. Earth + City will be serving up refreshing cucumber mint lemonade. · Throughout the month of July they will be featuring strawberry ripple macaroons. · Try some freshly made dips with your choice of onion or raison flatbreads! Animal Liberation Kitchen will continue to have delicious vegetarian sliders and jackfruit tacos. Make them your coffee stop for organic fair trade coffee. They roast the beans freshly at their two locations daily. Try some of drip coffee at the market visit and take home a bag for yourself all week long! Through their commitment to offering clean and healthy choices to Toronto, Molly B’s offers a large variety of baked goods for the gluten-intolerant and celiac. They are a staple within the farmers market community, attending five different markets each week. 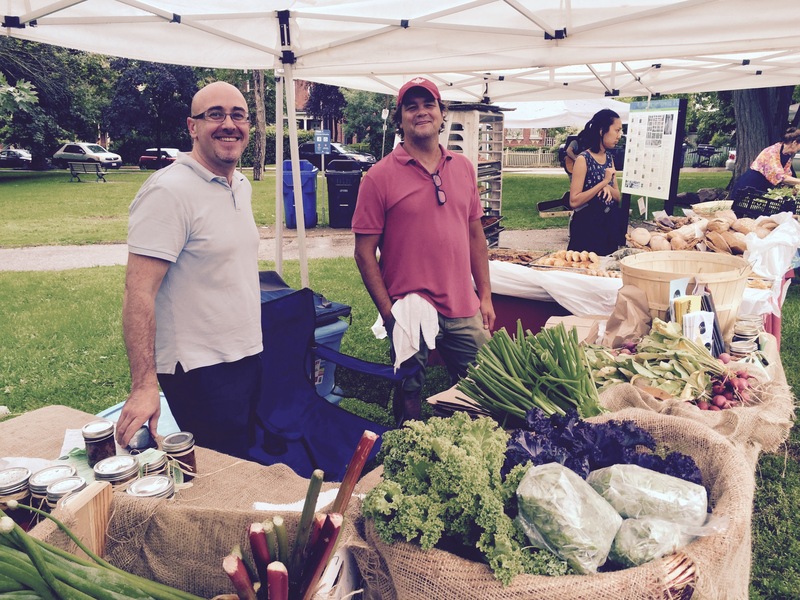 As previous vendors of the Riverdale market, they are elated to be back seeing the friendly faces of Cabbagetown once more. Try some of their sweets (brownies, tarts, and more! ), purchase their pizza crusts to use at home, or snack on their freshly prepared pizzas while you shop! Try out our first weekly recipe, with many more to come, showcasing in-season produce. This week it’s beans, beans – glorious beans. Provided by Gail Gordon Oliver & originally published in the Edible Toronto Magazine (If you like this recipe, read more from the latest issue is available at the market). Used as either a warm or cold salad or side dish, these green beans pack lots of flavour with very little effort on your part. The beans are simmered until almost at the tender-crisp stage and are then tossed into a highly aromatic oil that’s redolent with garlic, ginger and pungent spices. Makes 4 to 6 servings. Have a large bowl of water and ice cubes ready. In a large sauté pan, bring to a boil just enough salted water to cover the green beans. Add the green beans and return the water to a boil. Reduce the heat and simmer the beans until they are bright green and almost tender-crisp. Drain the beans in a colander and then immediately immerse them in the ice water. When they are no longer hot, return the beans to the colander to drain. In the same sauté pan, heat the oil over medium-low heat. Add the cumin seeds, mustard seeds, turmeric, salt, cayenne and garlic. Cook, stirring continuously until the mustard seeds start to pop, about 2 minutes. Immediately add the green beans back to the pan and cook, tossing occasionally until they are heated through, about 2 minutes. Serve immediately or refrigerate for later use. This recipe was first published in Edible Toronto magazine’s Summer 2014 issue.